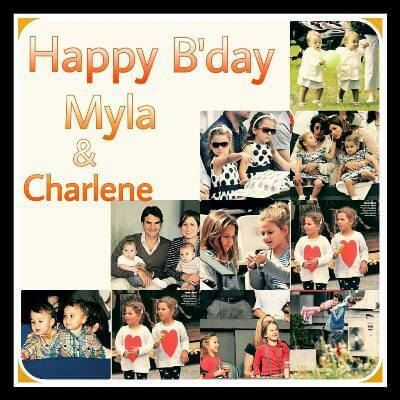 Happy 7th Birthday Myla Rose and Charlene Riva! How time flies! The Twins are growing up so fast! It is Myla Rose and Charlene Riva’s 7th birthday today. Let’s take a look back at the most significant milestones in these amazing 7 years. 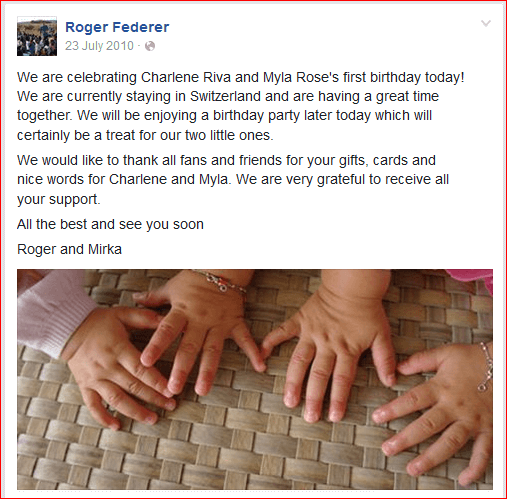 On 12th March 2009, Roger announced on his website that He and Mirka were going to be parents. It was a news that got everyone excited! It was the most amazing news we all had heard in a long while. On 11th April 2009, Roger and Mirka got married in a fairytale wedding. It was the most beautiful ceremony anyone could imagine. After exchanging vows in a civil ceremony, they hosted a reception for close friends and family and it was an occasion to celebrate. All his fans were ecstatic! 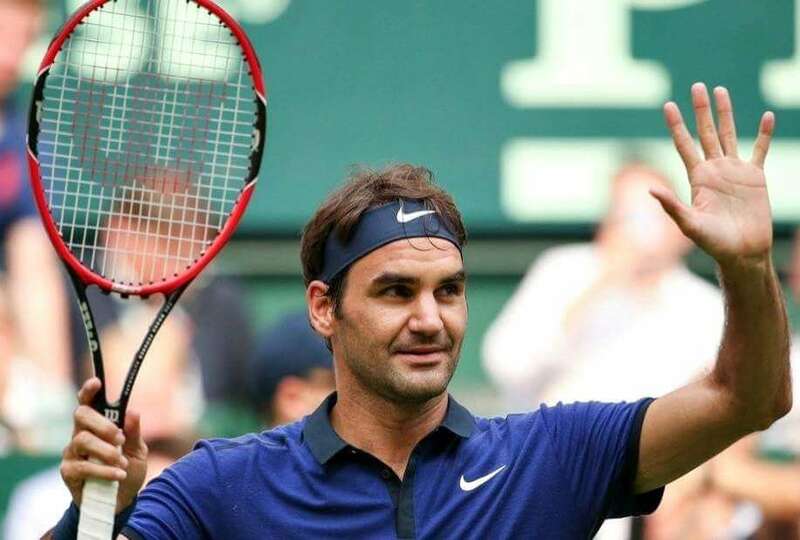 On 5th July, Roger Federer played a marathon final against Andy Roddick, it was a brilliant roller-coaster 5-setter replete with heart attack moments. Roger won the championship 16-14 in the final set. 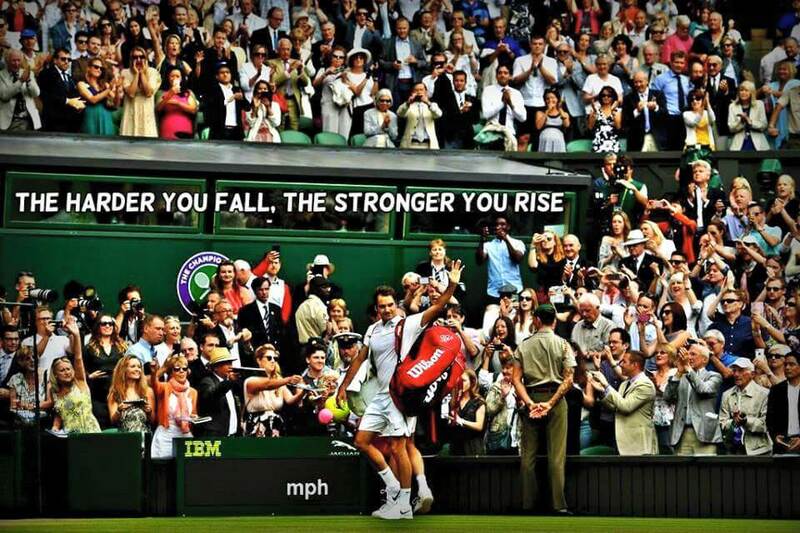 It was a match that tested grit, patience, physicality and focus of both the players, where finally Roger prevailed. But during this whole topsy-turvy match, it was Mirka who stood out even more. She was about 8 months pregnant and she was sitting in the mother of all marathons, all resolute, supporting her husband like a true Iron Lady. All through the match, she was there, she looked tense too. Many feared she could go into labor just because of the tense match. But she held on and saw Roger lift the trophy. On 23rd July, Mirka gave birth to twin girls, much to the pleasant surpise of everyone. Roger announced the birth of his twin girls the next day on his website. His fans and the media around the world were euphoric with the news. They named them Myla Rose and Charlene Riva. It was the most wonderful news and we were really happy for Roger and Mirka. 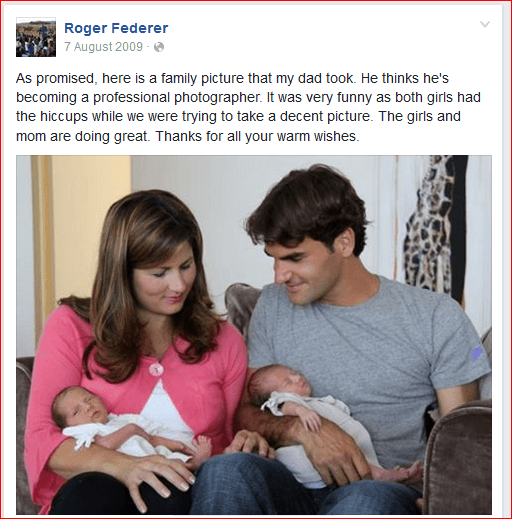 On 7th August 2009, Roger posted an adorable Federer family picture; this was the very first picture of the twins that the fans got to see. 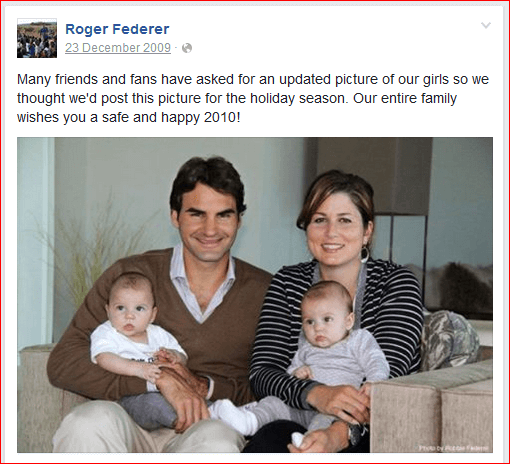 On 22nd December 2009, The Federers posted a Christmas greeting for their fans with a family portrait picture on Roger’s website. And an extended wish followed on facebook too. On their first birthday, Roger posted an adorable picture of their little hands and their cake. He also mentioned that there would be a party for the little ones later. After their first birthday, the twins have been common fixtures in the Federer camp in most of his big matches. They either read or play around and see their Papi play. They witnessed Roger winning his 17th Grand Slam and his 7th Wimbledon title in 2012. There were heart-melting pictures of them blowing kisses to their Papi. It was such a beautiful sight. Even when Roger won Madrid Masters in 2012, he came to his camp and kissed Mirka and kissed his girls. They enjoy being on tour and accompany Roger on many of his practice sessions where they give coaching lessons as well. Roger of course enjoys it thoroughly. Many bookies have pegged the twins as future Wimbledon champions in both, singles and doubles. It remains to be seen though if they even take up tennis professionally. 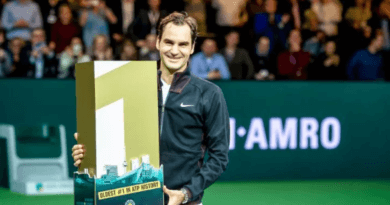 Probably keeping in mind the grueling tour, Federer has once said he didn’t wish a pro tennis life for his girls, saying that if they were to take on any sport it might be something more Swiss-like, such as downhill skiing. “I think they need to know whatever they choose, they have to work hard at it,” he said. For now, however, they are on the tour with their dad, observing, listening and playing as any little kids would do. And sometimes, Federer said, they act as coach to him, too. As they turn seven today, their age will equal the 7 Wimbledon titles their Papi has won and who knows, maybe next year before they turn eight, hopefully federer will gift them his 8th Wimbledon trophy. 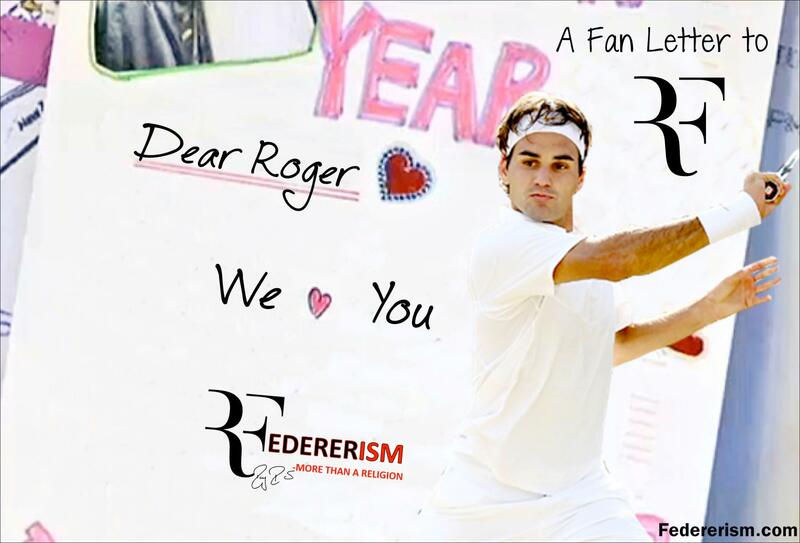 We at Federerism.com, join all the fans everywhere in wishing a very Happy Birthday to Myla & Charlene!! May they be showered with loads of happiness and success in their lives! You rocked Roger’s life and Roger is rocking our lives for last so many years and we hope many more such years come. 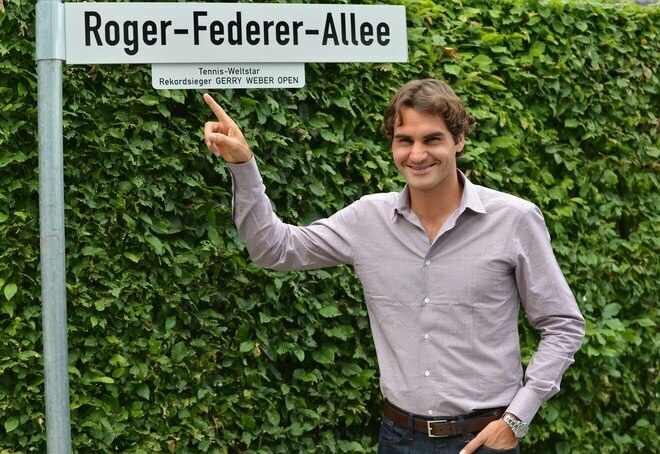 First a postage stamp and now 2 whole streets named after Roger Federer! God bless the two sets of adorable twins and their fantastic parents too !